Kitchen cabinets, bedroom cupboards, bars, studies, shopfitting applications, garage storage, shelving, worktops and bathroom vanities. Welcome to Boardprep, your complete solution for semi-finished and finished kitchen and furniture components. We process a multitude of wood-based panel materials into components that are the basis of beautiful kitchen and bedroom cupboards and many other interior decoration projects. 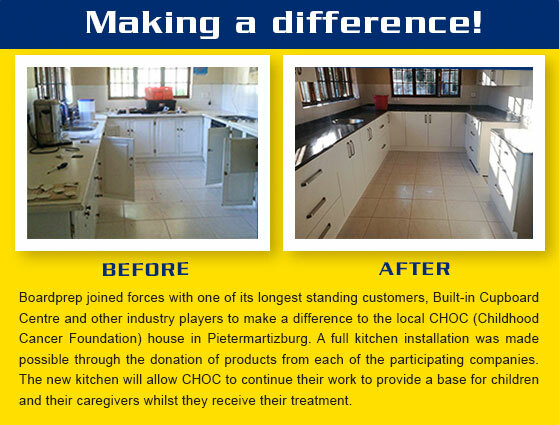 Boardprep is the number one processor of wood-based panel materials for the kitchen cupboard, interior decorating, office furniture and DIY home improvement markets in the KwaZulu Natal province, South Africa. TEST YOUR COLOUR SCHEME HERE!. Try our Boardprep Visualiser here. Experiment with colour schemes for your kitchen. Click on the visualiser, choose from a variety of colours for your doors and tops. Try handles vs no handles and change your floor and wall colours. 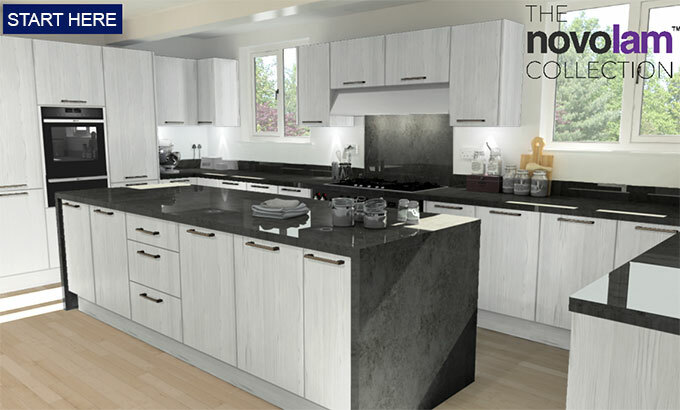 Please note: this is a sample kitchen layout that offers various features, allowing you to visualise various colour options. A few easy steps to your dream kitchen! Getting started on your own home project can be exciting and daunting. From the start, how can you be sure that you’re getting the best deal? How do you compare quotes? Sometimes there is such a huge difference between them, you wonder how! Here are some key areas to look for to ensure you’re comparing like for like. Industry standard BIC height is 2.45m. There are suppliers that operate on a standard height of 2.1m. This can translate into quite a different cost across a number of units. Aside from cost, it can have a very strong impact on the design and finish in your room – is it what you expect? Boardprep’s BIC standard height is 2.45m. 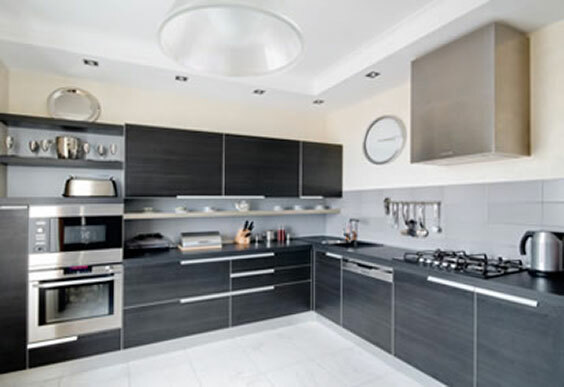 Both kitchen and bedroom cupboards are made up of cabinets, a self contained box. These are placed side by side to create the continuous sequence of units. The strength of the self-contained unit is greater, however, costs can be cut by “sharing” panels between units. This can compromise the strength of the unit, particularly when the shared panel holds the hinges for the cupboard doors. Equally, a quote that offers shared walls or party walls will be significantly cheaper than the correct complete unit. These are the working parts of your cupboard. As you’ll be opening and closing that cupboard or drawer for a long time, its worth spending a little more on solid, well made hinges or runners. You probably won’t notice it when its working well, but it’ll be annoying when it plays up! Boardprep’s fittings are sourced from leading premium manufacturers. A full range of options are available to suit every budget. Quality is never negotiable. There are many grades of board materials on the market. Some manufacturers use “Utility Grade” board which appears grey, not white. The price and lifespan of the board directly correlate to the grade of the board. Boardprep only use the highest quality A grade board. Some manufacturers use Iron-on edging, trimmed by hand. Most will edge by machine, using EVA glues. Only a handful of top manufacturers have state of the art machines that use PUR gluing systems which offer the best adhesion and thus water resistance and a quality finish. Edging may have little relevance to you initially, but when it starts peeling off or the board starts to burst from it due to water damage, you’ll see it in a whole new light. Boardprep has established a reputation as the supplier of choice for projects large and small, with a full range of components to offer for every project and development.